NOTICE: The renewed ESQ Collecting Permit has arrived. The information here and the Application form are updated to comply with new ESQ and QPWS requirements as of August 2018. To be eligible to apply for a permit, you first have to be accepted into society membership. While membership is open to anyone with an interest in entomology, we discourage people from applying solely for the purposes of obtaining a collecting permit. Students and others who have an affiliation with an institution and a current project supported by that institution should apply for their own permits through QPWS. Please allow at least 6 weeks for permits to be processed. Permit holders are required to submit an annual report with lists of all the species you collect with related data to be sent to National Park databases. Please read all of the information below to be aware of the responsibilities of having a permit. Queensland's native plants, mammals, birds, reptiles, frogs, some fish and invertebrates, and all wildlife and natural resources found within protected areas are protected by the Nature Conservation Act 1992 (NCA) and its Regulations to ensure the conservation of nature. A licence, permit or authority is needed to take, keep, use or interfere with many native plants and animals for educational or scientific purposes. Anyone wanting to take protected wildlife or to undertake scientific research or educational activities on protected areas and forestry areas should become familiar with the laws outlined in the relevant Acts and Regulations. The society currently holds two Scientific Purposes Permits authorising the collection of insects and arachnids not listed in Schedules, 2, 3, or 6, of the Nature Conservation (Wildlife) Regulation 2006 (see List of Protected Invertebrate Species 2006 in Resources below). They cover numerous, but not all, National Parks, State Forests, Conservation Parks and Forest Reserves with a full list of parks provided in Resources below - ESQ Protected Areas, Conditions and Contacts. As of July 2018, 42 parks have Areas Not to be Accessed because of Native Title Determination (details in Resources below with the parks list and in the folder of Maps of Parks with RAA). These permits are intended for legitimate scientific research only and are primarily for the opportunistic collecting of voucher specimens to enable the correct identification and confirmation of species present in protected areas. All members of the society who are residents of Australia are eligible to apply for the ESQ permits. The society however would prefer that members who have a strong affiliation with an institution and a current project supported by that institution apply for their own permits through QPWS so as to decrease the amount of administration that the society has to provide. PhD students and members who have a history of commercial activities will be asked to show cause why they should be provided with a society permit instead of applying for their own permit. Members who are currently holders of a commercial licence are excluded from gaining a permit. Members who are unfinancial and/or fail to provide an annual return when asked will be asked to show cause why they shouldn't be deleted from our permit list. You are required to understand and abide by all conditions pertaining to each individual permit (there are differences between the permits). We have developed a set of 9 ESQ protocols for access to protected areas for all collectors which the society will expect its members to abide by when collecting under our permit. We have also developed a CHECKLIST of 5 PROCEDURESto help you fulfill the requirements and conditions of the permit. These are outlined on the Application Form and are available in Resources below. These are unique permits and we expect all members to keep this in mind when collecting as a loss of these permits would be detrimental to all concerned. Reports are due once a year via a return form (around mid-May each year). In the case where a member has not used the permit through the year a nil return is acceptable. The ESQ Return Form 2018 with a completed example and the Return Guidelines can be found below in Resources. Fill in the last page of the ESQ Collecting Permit Application Form with your details, your HOME address, sign and date it, and send it to the ESQ permit officer (Dr. Christine Lambkin) preferably as an attachment to an email. The ESQ website has a dated list of reserves that we have permission to access and collect in. Extra conditions apply to reserves with parts that are RAA or CYPAL/IMA/ or ILUA (See ESQ Protected Areas, Conditions and Contacts in Resources below). As part of this application if you potentially will access Reserves with RAA or CYPAL/IMA/ILUA areas you are required to DOWNLOAD and save the ESQ Proposed Access to Reserves with Native Title Determination Areas Spreadsheet in Resources below. Add your name and place a YES against any Reserve that you propose to visit during the life of the permit. Save the completed spreadsheet and email to the ESQ permit officer, Chris Lambkin, with your completed Application Form. Your application will then be assessed and your membership status checked. If approved you will be sent the permits as a PDF. If there is any doubt as to your application’s suitability your application will be taken to the ESQ council to be discussed and if necessary you will be asked to give additional information. Please allow 6 weeks for the process, in most cases permits are granted in a shorter timeframe but as the permit officer is voluntary there may be time periods when there are delays. “Express” permits may be granted in exceptional circumstances but please be aware that these may not be able to be granted in the couple of days that some members request. 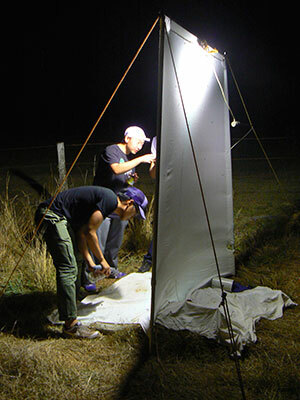 As part of the CHECKLIST of 5 PROCEDURES, prior to commencing work in protected areas in Queensland, the ESQ member endorsed on the Entomological Society of Queensland Collecting Permit must COMPLETE a separate on-line form for each park or reserve to be entered at http://www.nprsr.qld.gov.au/licences-permits/commercial/research-field-work-form.php at least 7 days (more is better) prior to entering the park giving actual times and proposed locations on the reserve. If the park has CYPAL, IMA, ILUA or RAA conditions (see park list) you will be required to complete this notification at least 3 months prior. You are to fill out the forms with 'Christine Lambkin' under the 'Authority Holder' and YOUR name, phone number, and email address in 'Contact Details'. You are also to request a notification email to be sent to you, which you then send to Christine Lambkin. Special access restrictions apply to some particular parks, a list is included with the full list of parks. you must be a financial member of the Entomological Society of Queensland. I have previously had the permit – do I have to reapply? Yes, as of January 2018, all our previous permits have expired and need to be renewed. All members, irrespective of whether they have previously held permits or not, must apply for the renewed permits. Can the permit be transferred? No, permits are not transferable. Members are more than welcome to advise other members of the permits and encourage them to apply. Which parks are covered by the permits? Refer to Parks List in Resources - ESQ Protected Areas, Conditions and Contacts covered by the society for 2018. 42 parks currently have RAA, parts gazetted Post-Wik that are AREAS NOT TO BE ACCESSED because of Native Title Determination. We do not have a permit that allows us access to those RAA. Even if you have consent from Native Title Holders, you cannot access those RAA parts of the park as you still need a valid permit. How do I get access to a park not on the list? In order for the permits to be amended you must contact the ESQ permit officer and give the official name for the park in question. The QPWS permit officer will be contacted with a list of amendments and once the amended permit is received it will be sent out to members. This will take months and, to decrease the amount of administration for both ESQ and QPWS, we will only be applying once a year, at the most. If biological material (ie insects or arachnids) is to be exported from Australia, a permit to export or import wildlife or wildlife products is to be obtained under the Environment Protection and Biodiversity Conservation Act 1999 from the Commonwealth Department of the Environment and Energy. The link above gives you information about these permits. There is a charge for this permit and it may take over 40 business days to process. Refer to the Nature Conservation Act 1992 Legislation and the List of Protected Invertebrate Species 2006 in Resources above. If members wish for assistance with datum/grid reference calculations then a good publication is the Map Reading Guide published by Geoscience Australia who also produces topographic maps. The associated roamer is also a good tool and makes reading grid references much easier.